Just when it looked like the Pier issue was pretty much settled and I would have to search for something new and dumb to write about, Tampa Bay Times Staff writer Waveney Ann Moore put up an article: No clear answer on when Pier can come down. And I was starting to worry about what to blog about. It is starting to look like the Kriseman administration's dedicated leader of the charge to demolish the Inverted Pyramid has once again put his foot in his silver tongued mouth. I was at the meeting when Karl Nurse asked Connors about the permitting, First Connors said yes they had all the permits, and then he said they didn't need an Army Corps of Engineers Permit to tear down the Inverted Pyramid since it was above the water. Didn't sound right to me; given that the Pier sets right in front of the largest marina in Florida, the Vinoy basin and marina and the City's mooring field. That makes all of the water around the Pier and the Pier head navigable water. But everyone on Council was so anxious to get this deal done and behind them no one followed up. 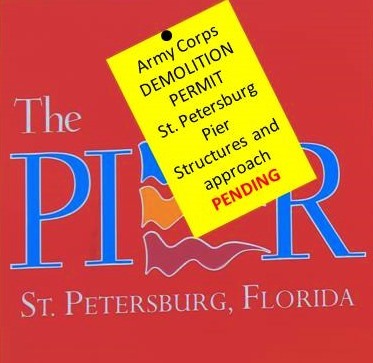 Quoting from Waveney's article: "Last week, U.S. Army Corps of Engineers spokeswoman Nakeir Nobles told the Tampa Bay Times that since the Pier is over navigable waters, the agency must issue a demolition permit for the entire structure — the approach, or bridge, the pyramid and the area surrounding it. Further, she said, work cannot begin until an agreement concerning historic preservation is finalized. The tentative timing for that is this fall, she said." For now they have pushed Tom Gibson, the City's Director of engineering, out in front to try to explain what's going on. Gibson, whose forte has never been explaining things to the press or the public, just seemed to further confuse the whole issue. Gibson, in true engineering fashion, demonstrated why the City hires consultants as he blamed to whole mess on the consultant hired to get the permit. Then there is the whole historic preservation agreement which the Corps says must be completed before demolition can begin. That could take months. In addition, has anyone checked with the Army Corps of Engineers to see if they will need permits to moor those barges used to haul away debris? By the way, has anybody checked with Glasbrenner to see what kind and how big the cranes will be and with the FAA to see if they have any issues? How much longer is City Council going to sit on the dais and drink up everything Mike Connors tells them. They have been misled or lied to so many times I would think they would finally figure out that this is a means justifies the end game and the end game is to tear that Inverted Pyramid down. With these kinds of shenanigans right out of the gate, it is hard to imagine what will go on in the Pier Park design meetings and what stories will be concocted to get Council to buy into what will be a "changing design". Nothing better than this permit debacle, could make the case for the Waterfront Referendum and the absolute need to put control of the waterfront in the hands of the public. Every time you turn over a rock in this project it becomes clearer you can't trust the administration, and City Council seems incapable or unwilling to act properly, ask the right questions and get the documentation to protect the City's most valuable asset.